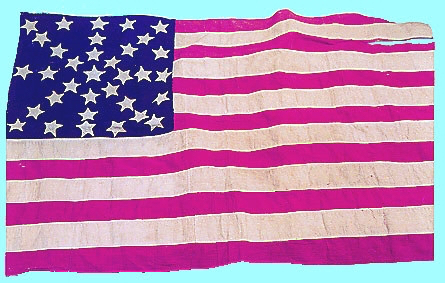 Julia Wilbur sewed this flag in the early 1860s. Image courtesy of Charles Lenhart. July 4, 1865, Washington, D.C. Recreational activities occurred, at least for Julia Wilbur in Washington, DC--get-togethers, and even fireworks. But the fact this was the first "independence day" post-slavery had particular meaning. "A Cat May Look at a King"
This image was drawn on Emancipation Day, about 8 months later, but gives an idea of the festivities. Washington, D.C. Bright, hot. Frances [Julia Wilbur's sister] & I went to the celebration of the colored people on grounds S. of White House. Chronicle says there were 7000 people there. It did seem like a Mass Meeting, of olden times. Mr. Cook (cold.) presided. Wm. H. Day was the orator...His oration was very fine. Rev. J. Pierpoint read a poem, but I cd. not get near enough to hear a line of it. Sen. Wilson made a good speech. Gen. Gregory & others spoke, but I did not hear them. While this was going on & an eager crowd trying to get and keep within hearing distance, the children of the S. schools & young people generally were enjoying themselves in various ways in other parts of the grounds. I was well paid for 4 hrs. standing. It was an interesting sight, so many well dressed colored people, & there was right smart of whites too. There was no misconduct. Every body was civil & well-behaved, even the soldiers present behaved themselves. It was for me a glorious Fourth of July. There was not white loyalty enough to have a general celebration. Sen. Wilson hopes there will be enough by another year. In the evening Frances & I went to see the Fire Works in grounds S. of President’s House. They were under the direction of the Supernt. of the Arsenal. 300 rockets were sent up & 100 shells were exploded, besides the splendid pieces of fireworks. I had never seen such a fine display. A vast number of people assembled to see them. The poor ‘Contraband’ had just as good a chance as any body, for a “cat may look at a king.” The evening was fine. The dawn of another Independence Day was ushered in yesterday by the usual firing of guns by men, and rattling of fire-crackers and toy artillery by the children. It did not last long, however, for the young folks and a large proportion of their elder, had arranged for an exodus from the dust and heat of the city to the shady groves in the surrounding country, there to enjoy the day. ...The speaker would not admit that the fighting qualities of the colored race were only just developed in the late war. In the first struggles of our land for freedom from British oppression the blood of the black man had been poured out, and in 1815, on land and sea, the white and black man had stood side be side in defense of our nation's rights.. It concluded with a description, by name, of each firework shot up in the sky, from "Bengola Lights," to "Pyramid of Roman Candles," to "National Coat of Arms," and ending, appropriately enough, with "Good Night." p. s. The next day--July 5, 1865, President Andrew Johnson signed an executive order that upheld the convictions of the Lincoln conspirators. The execution took place two days later.